Commissioner Nick Fish, Wheeler and Golub all noted that the proposal asks the city to waive taxes on tickets that would not otherwise exist without the Timbers spending $50 million on an expansion. “It seems reasonable to ask for an exemption on taxes that would not already be generated,” Fish said. It’s still not a huge subsidy — about $2 million over the course of the decade for the tax break, plus whatever the increased maintenance and insurance costs tack on — so the deal still looks pretty good for Portland, assuming Portland taxpayers have any interest in the Timbers having a bigger stadium. (Better access to tickets for otherwise sold-out games, I guess?) 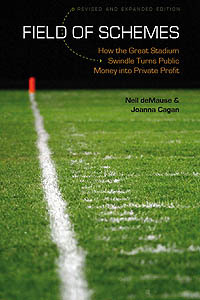 But it’s an important reminder that sports team owners — and development tycoons in general — see themselves as very different from you and me: Whereas our taxes are the price we pay for having the benefits of a democratic government, their taxes are a gift they’re giving to the public, and which they can ask to have rescinded at any time if they want to use the money for something else. Nice work if you can get it. The real story in the Pacific Northwest is the Tacoma baseball team offering a taxpayer stadium to another sports team for a big piece of the action. If you count “city hasn’t decided how or whether to fund 5,000-seat minor-league soccer stadium” as a big story, yeah. Yes nobody thought much about a Richmond baseball team asking the city to build them a new park back in the mid 80’s..Folks this is a new addition to the baseball business model. We get it done for a piece of the action. Has any city outside of California ever said no to any baseball team on any level ? Minneapolis and Miami, about a dozen times before they eventually said yes. Boston, sort of? Chicago with the original Cubs’ subsidy demand? The Chicago mayor is a huge cub fan , he was going to give the cubs a huge subsidy until the owner of cubs started insulting the mayors former boss Obama. Phoenix voters nixed what would become the Dbacks expansion, but our elected officials fell on their knees to satisfy the owners and pocket some campaign cash. Seattle voters and the Washington legislature did the same with the Mariners in 1995. “Big piece of the action” meaning “Getting to run the Sounders’ minor-league team,” then, yeah, yuge story. No. They don’t run team. They run the business side ! Tickets , parking , concessions , merchandize etc. At baseball prices and free rent that’s a nice chunk of change on 5k a game. bare… no time for editors, publish! Exactly ! They always get everything they want. Therefore I can see more of these types of arrangements in minor league cities across the country. Hell it was in the works with the Mets & MLS until the Mets got screwed by Madoff. The Islanders also approached the Mets .